One of my favorite birds is the sandhill crane. Their appearance, ecology, resilience, and their signal of spring all appeal to me. They also brought my wife, Sue, and I together. What’s not to love? Sandhill numbers have had changed dramatically in the past 175 years. Kumlin and Hollister, early ornithologists in southeast Wisconsin, believed that sandhills were an “abundant and common migrant” around the 1850’s. Sam Robbins wrote in Wisconsin Birdlife (published in 1991) that people thought that crane numbers greatly declined around the early 1900’s due to hunting, and wetland drainage for agricultural development. 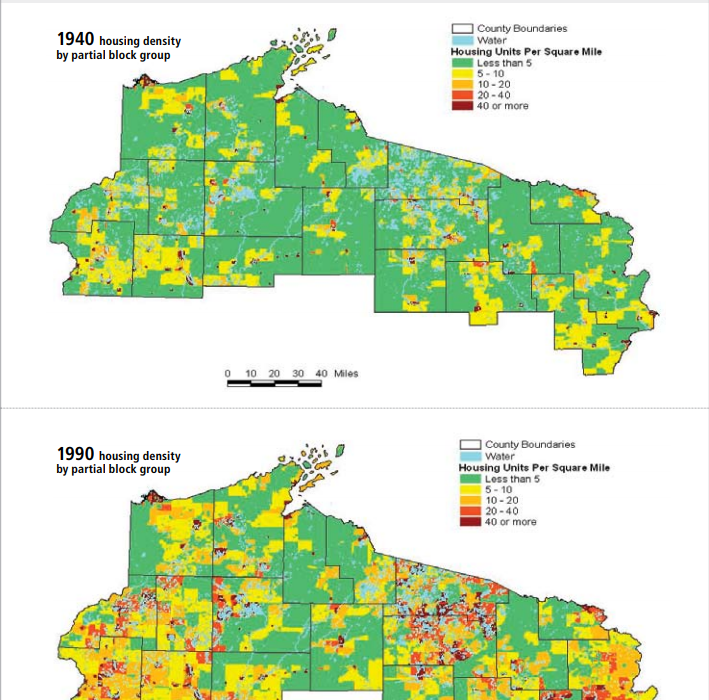 In the mid 1930’s the state wide population was estimated at around 25 pairs mostly in west central Wisconsin. Aldo Leopold thought that sandhill cranes would disappear from Wisconsin and penned “A Marshland Elegy” in the 1940’s to mourn that idea. Students at UW Stevens Point began studying cranes in the 1970’s. Ernie Gluesing conducted an aerial census and estimated the state population at 850 in 1973. He also studied crane territories and reported that territories averaged 339 acres. In the 1970’s I enjoyed fall visits to the area around Muir Park in Marquette county where several hundred sandhill cranes staged and fed in the surrounding area. The Fish and Wildlife Service acquired the large wetland complex adjacent to Muir Park for the cranes. At that time cranes were still uncommon in Dane and Jefferson counties. 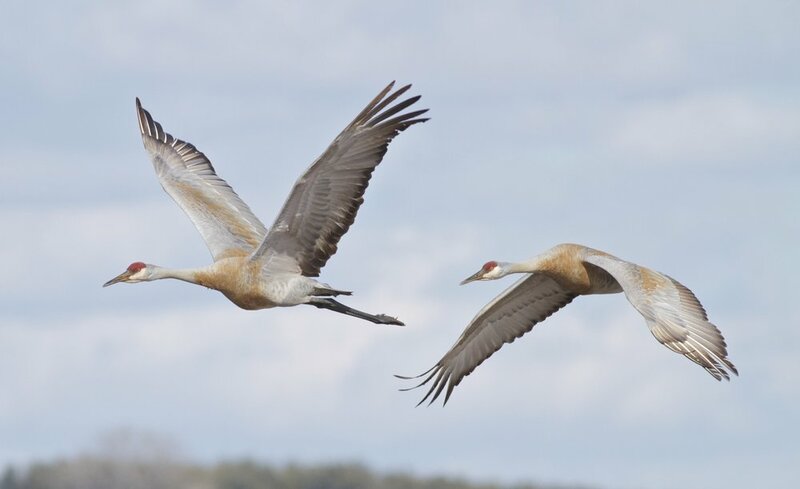 In the mid 1970’s the International Crane Foundation began their annual sandhill crane count that now covers parts of six states. I fondly remember attending a February 21, 1978 meeting at Piason’s restaurant to discuss the Dane County crane count. My friend Dorothy Haines was there and brought along her friend Sue Foote. I apparently made a memorable impression on Sue when I ordered milk with my pizza. (You might know the rest of that story: we dated, married, immediately moved to Goose Pond Sanctuary to take over as resident managers, and have been there ever since!) Ron Sauey, co-founder of the International Crane Foundation, joined us and later that evening, according to my diary, gave an “excellent talk on Siberian cranes” at the monthly Audubon meeting. Sam Robbins wrote sandhill cranes were that cranes were an uncommon migrant and uncommon summer resident. 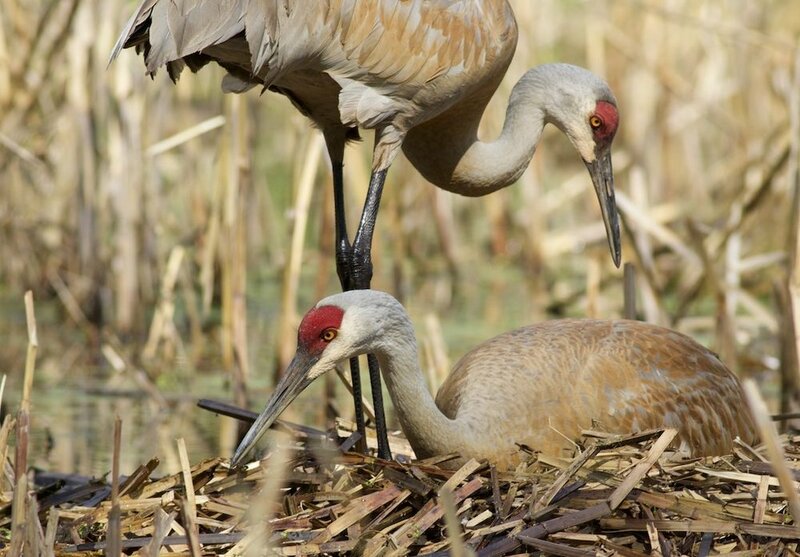 Sam also mentioned crane researcher found nests with eggs as early as April 22 and that most cranes left Wisconsin in October following the start of the waterfowl hunting season. Crane numbers and biology have changed much since the 1970’s. The first Breeding Bird Atlas (1990’s) found cranes incubating by March 22. Cranes also nest on small wetlands and appear to have smaller territories. 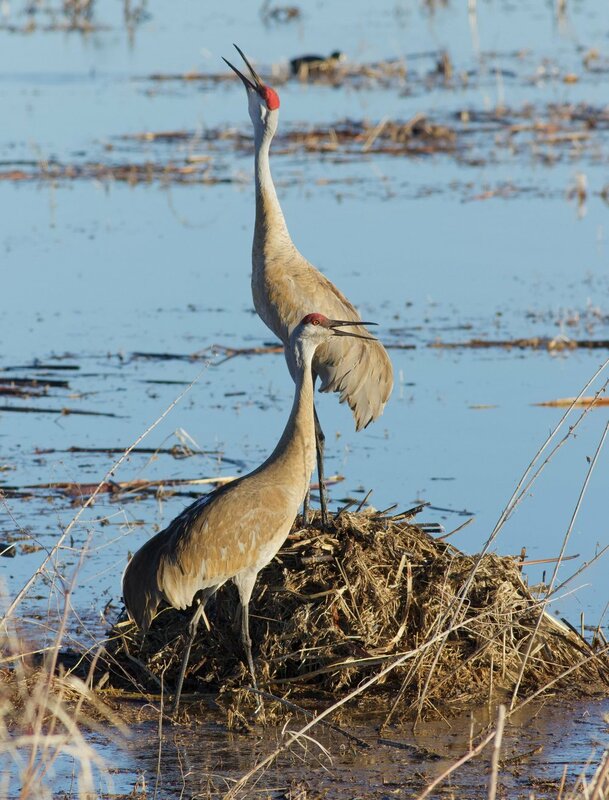 Cranes do not leave Wisconsin when waterfowl hunting season begins. Thousands of cranes stage at Crex Meadows in Burnett County and along the Wisconsin River in Sauk County by the Leopold Shack and Foundation, and do not usually leave until November. Crane numbers have also greatly increased in Columbia County. In 1995, Sue and I recorded the first sandhill crane nest at Goose Pond and continue to participated in the annual crane count. 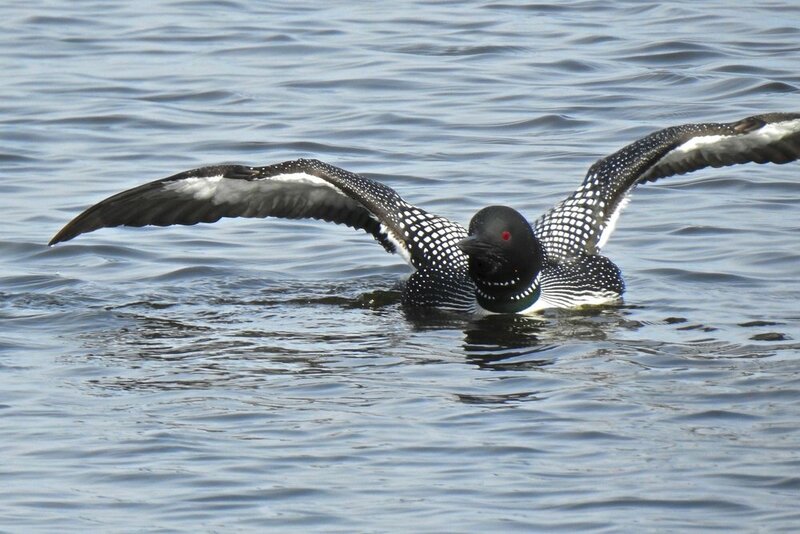 This year, I counted at Goose Pond on April 13. I was excited to be up before dawn and wondered what I would find with record amount of water. It did not take long to hear and see cranes and ended up finding three pairs and two individuals. Usually there are a pair of cranes on the west pond and a pair on the east pond. Goose Pond was alive with birds. I counted 37 species of birds by 7:30 a.m. and ended the day finding five more species. Highlights that day included 16 species of ducks, a flock of 25 white-fronted geese, two horned grebes, large numbers of American coots, and a pair of northern harriers with the male in courtship display. At dusk I was treated to seeing a short-eared owl hunting about 50 yards east of the house. There are two pairs nesting on the west pond with 40 yards of Prairie Lane and Goose Pond Road and probably a pair in the Manthe wetlands on the east pond. Sue and I hope you can visit this summer and enjoy these fascinating birds along with the other wetand and grassland birds. I first knew swans to be nasty things. A mute swan on a neighborhood pond would lunge at me when I got too near, and the popular depiction of swans as graceful elegant birds for me morphed into a fear of their hissing aggressiveness. Tundra swans, meanwhile, are beautiful Holarctic migrants, moving through Wisconsin each spring and fall in large flocks, often associating with diving ducks like canvasbacks and redheads. These diving ducks will access tubers and grain in the bottoms of ponds and flooded ponds, while the swans can do the same with their long necks. Tundra swans can be identified by their all white feathers, their black bill, and a yellow spot on the lores. The birds will typically form pair bonds for life, and can live to be over 20 years old. Unlike the non-native and stocked mute swan, which often sits solitary on a residential pond, the tundra swans congregate in great flocks of thousands of birds. 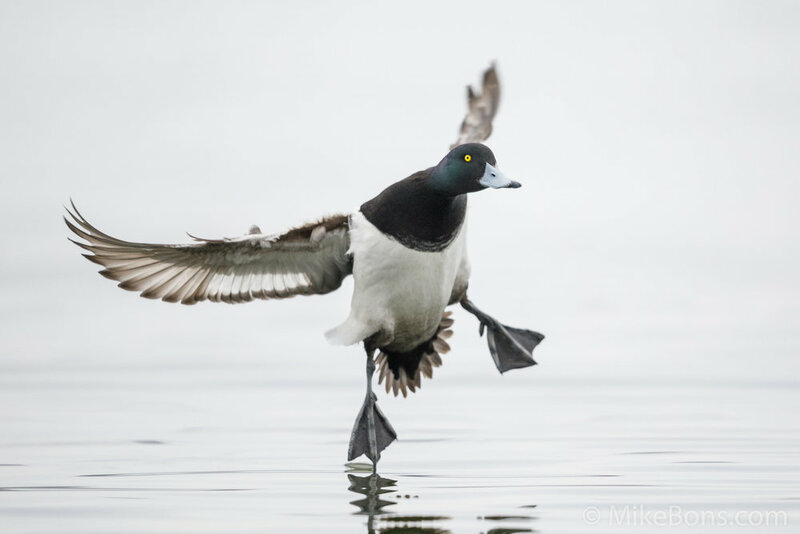 In spring, these birds are moving from their wintering grounds on the Chesapeake Bay to breeding habitat on the Arctic Circle. In the past week, a flooded field north of Faville Grove Sanctuary has been occupied by over 1,000 tundra swans and thousands of waterfowl including northern pintails, canvasbacks, redheads, scaup, mallards, northern shovelers, and ring-necked ducks. These huge migratory flocks tend to be uncommon at Faville Grove, since there are not any huge open water wetlands within the sanctuary. However, a wet start to spring has provided excellent habitat for migrating waterfowl in these flooded fields. It’s not hard to appreciate the huge flocks of birds, especially the large and alluring tundra swans, as they make their way on an 1,800 mile journey to the north. As Wisconsinites, many of us pride ourselves on our cold tolerance during harsh mid continental winters. People joke about grilling shirtless in the snow, and we openly chuckle when southerners look like they’re about to cross open tundra at 55°F. Our confidence ends when open water is involved. Strong rivers like the Mississippi, Wisconsin, Wolf, and Rock have high enough flow rates to keep from freezing, and the Great Lakes also retain open water. Because it is a poor insulator, water saps heat from the body with deadly speed. Common goldeneyes (Bucephala clangula) and a few other hardy water birds in Wisconsin don’t huddle on the surface in a melancholy group, but rather splash around as though enjoying a warm bath. 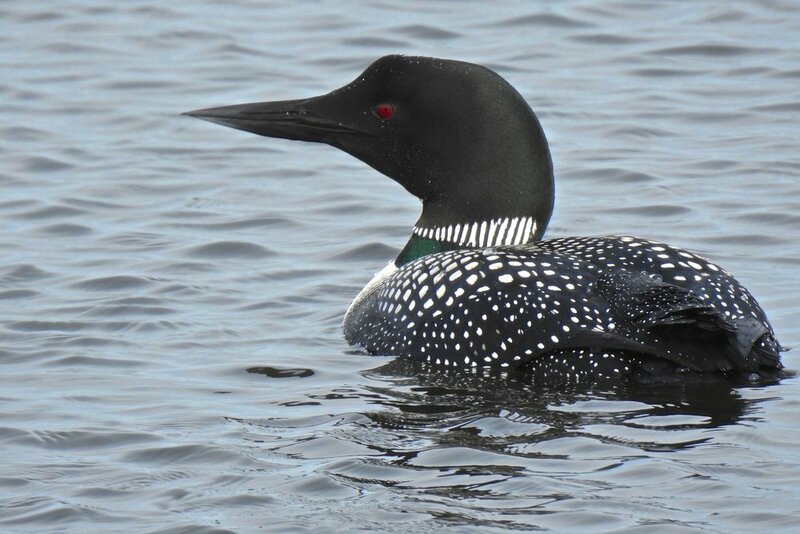 Drakes are black and white with an iridescent black and green head that features a conspicuous round white spot near the base of their bill. Hens have a brown head, yellow bill tip, and gray body. Goldeneyes do indeed have golden eyes, but this is not diagnostic as many other diving duck species claim this characteristic. Strong wedge shaped bills are perfect for crushing shellfish and other aquatic invertebrates. Fish and fish eggs are also preferred food sources, and goldeneyes usually forage in water that is five to twenty feet deep. 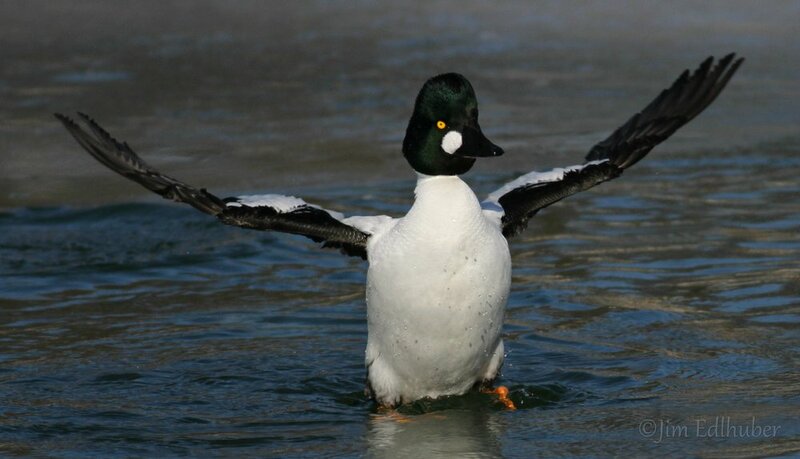 Common goldeneyes trend as far north during winters as the ice line will allow. They are some of the last ducks to show up during the fall migration and are early pioneers in the spring. The first ducks to arrive at Goose Pond this year were a trio of goldeneyes, and they’ll likely be headed north to Canada’s boreal forest for breeding within the next week. Low densities of goldeneyes do nest in Wisconsin with concentrations around the boreal forest habitats of Bailey’s Harbor, Door County and Lake Namekagon. It is well known that wood ducks are cavity nesters, but three species of diving ducks utilize tree cavities including buffleheads, hooded mergansers, and goldeneyes. Characteristic trees of a boreal forest are conifers like spruce, balsam fir, and tamaracks, but some deciduous species like aspen, cottonwood, and white birch are mixed in. Conifers make for poor cavity trees as their wood is less susceptible to microbial decay, and the deciduous species listed above are prone to rapid deterioration and toppling over at a young age. Goldeneyes can’t dig into trees, so how do sufficient amounts of nesting cavities exist in boreal forests? Pileated woodpeckers and northern flickers are primary excavators, meaning that they mine new holes into trees with their specialized beaks. The cavities are used in subsequent years by wildlife (secondary cavity nesters) including flying squirrels, chickadees, nuthatches, barn owls, buffleheads, goldeneyes, and a plethora of other bird species. Goldeneyes have been found nesting in wood duck boxes, but this is rare because duck boxes are not usually erected within the goldeneye breeding range. With an abundance of sheetwater at Goose Pond, waterfowl species are gravitating to the area in search of food, rest, and potential breeding sites. 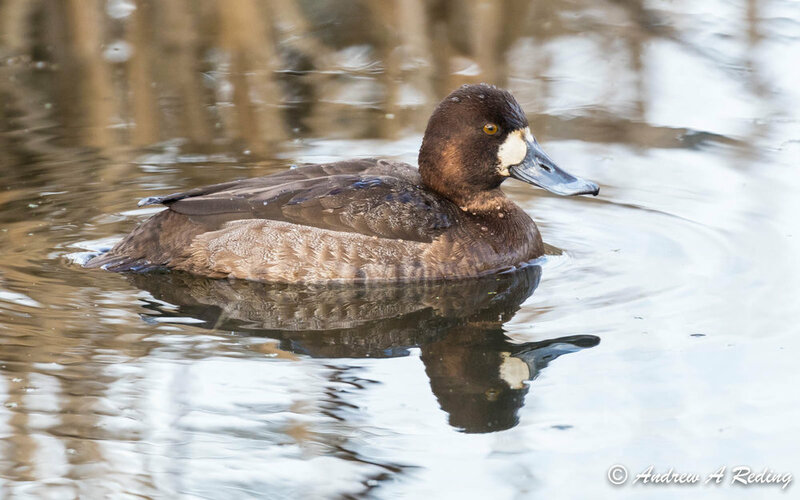 Goldeneyes, redheads, scaup, buffleheads, ring-necked ducks, hooded mergansers, pintail, widgeon, mallards, wood ducks, and Canada geese can all be viewed from Kampen Road. Check out the Goose Pond eBird Hotspot to see what birds are on the pond, and to record what you see. Record high water levels flooded muskrats out of their houses, and now groups of eight or ten individuals commonly squish themselves together to sunbathe in a furry clump within fifty yards of Goose Pond Road. Almost all goldeneyes will be gone by April, so don’t hesitate to come out and look for them. Goldeneyes still have to travel hundreds of miles north to arrive at their core breeding grounds, and they certainly won’t wait for you.